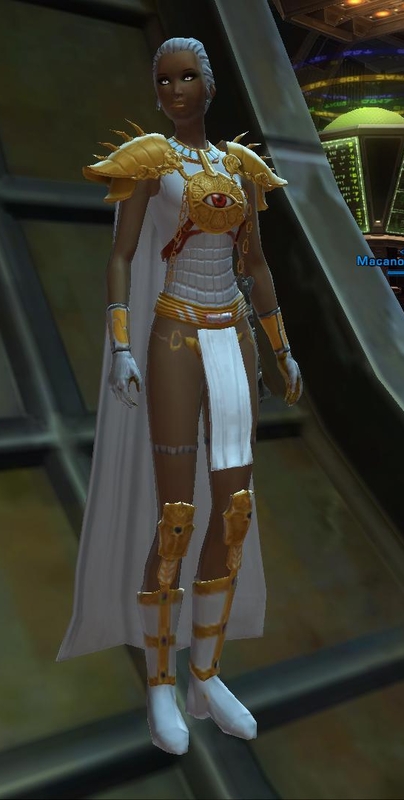 This ruins a perfectly good Naga Sadow outfit. He’s rolling over in his grave. 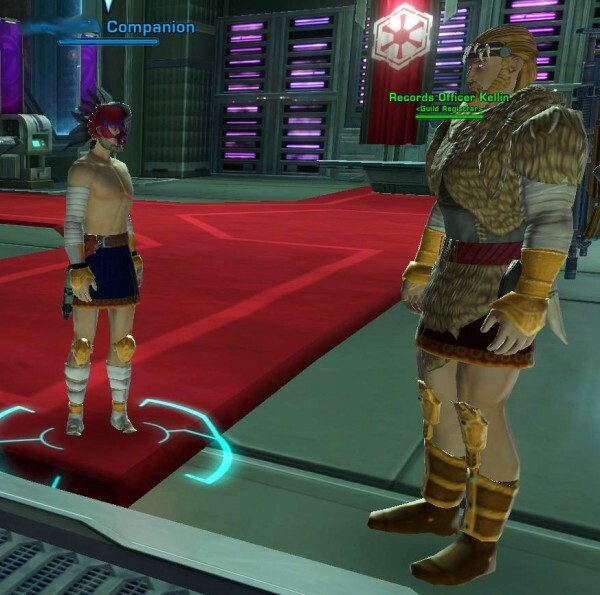 At least they’re wearing skirts – still look ridiculous. Bad enough but matching HAIR? 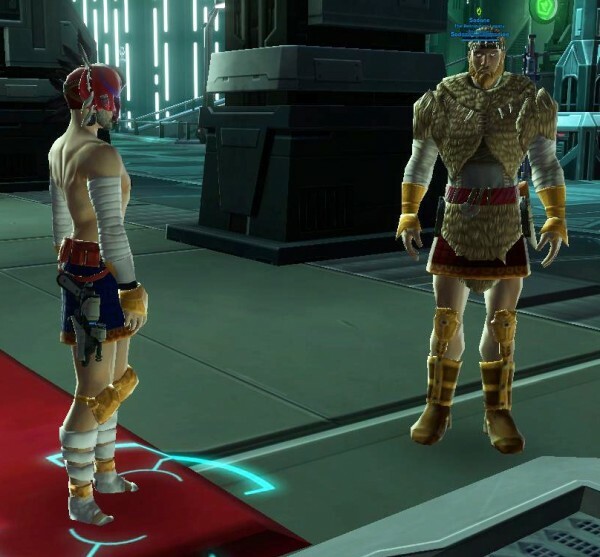 The karagga hat never looks cool, guys. Let us not forget the name category, now. 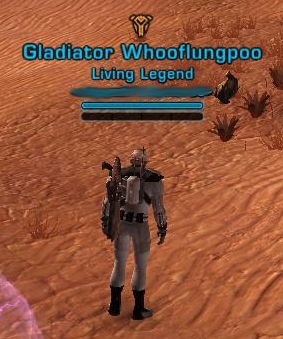 I wonder if “whoflungpoo” was taken. Lest you think the world is completely dark and full of terror, I saw this fine specimen on the fleet. Rawr. Nothing like a man in uniform. 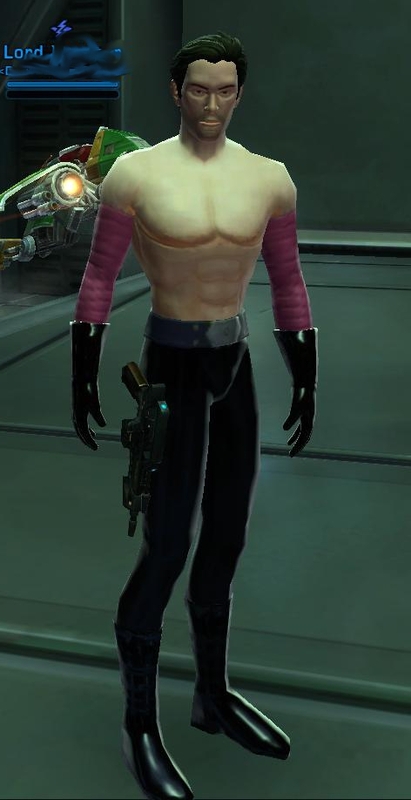 And, of course, I’ve improved my Andronikos to make him more sexah, if that’s even possible. I’m still amazed by the number of people I see running around with the pink/white or white/pink dyes; like so many of the other color combinations, they look hideous on virtually all of the gear pieces — all you need, for example, is some leopard-print collars and cuffs to make a trenchcoat, knee boots, and the bounty hunter’s wide-brim hat with the pink/purple dye to be truly pimptastic. Is it just me, or isn’t it a bit chilly on some of these places to be going pantless? Still, some of those names are priceless. To be fair, it is very easy to abuse the dyes because the folks at Bioware show the color sense of a Hutt. :sigh: I’d love to see some rich, understated colors instead of a bunch of day-glo Mattel rejects. 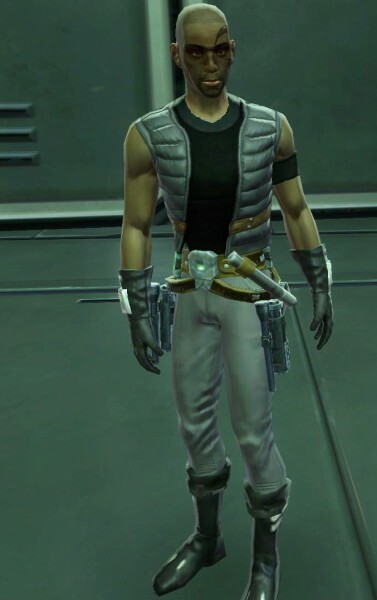 Other than the “we’ll make what color(s) of dye you get a crapshoot, so you’ll have to spend more cartel coins on packs to get the dye you want” and “we don’t want to see every Sith running around as Lord Darkity-Dark-Dark of the Dark legacy wearing all-black gear, so we’ll make the dyes with black _really_ rare” premises, both of which boil down to ‘you can color your gear how you want — within the limits we set — as long as you pay enough for the privilege’, I don’t see why gear colorization wasn’t set up as part of the Appearance Customization kiosks, where you could designate a piece of gear to be colorized, pick your primary and secondary colors from a list (or a grid showing the color range), and be assessed a fixed fee for the change. We could have had more colors to pick from, had better control over the primary/secondary pairings, and by making it easier and more convenient to recolor your gear, it would likely have been more profitable for Bioware. 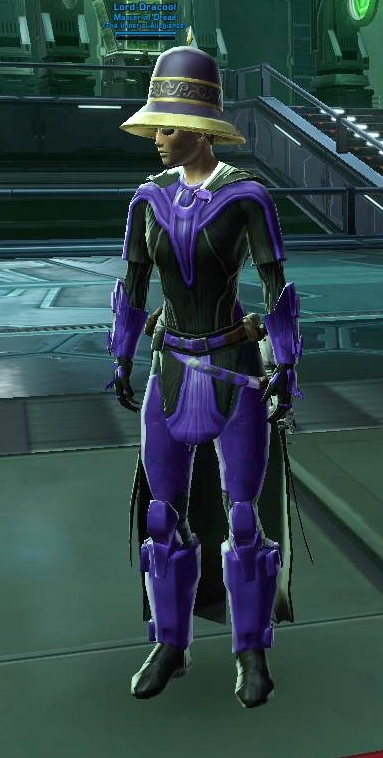 OK, I kind of want to name my sith “Lord Darkity-Dark-Dark” because that made me snort. Most of the dyes do not represent the color combinations that are the defaults on the gear in-game – and many of those default colors are quite nice. Just because we were bored with all-brown robes doesn’t mean that the answer is bright pepto pink. “Lord Darkity-Dark-Dark” is a play off of a ‘flavor of the month’ build from City of Heroes — the Dark/Dark/Dark Defender (Dark Miasma primary powerset, Dark Blast secondary powerset, Dark Mastery ancillary powerset); these got referred to as either a ‘Darkity-Dark-Dark Defender’ or as a ‘4D’ build. 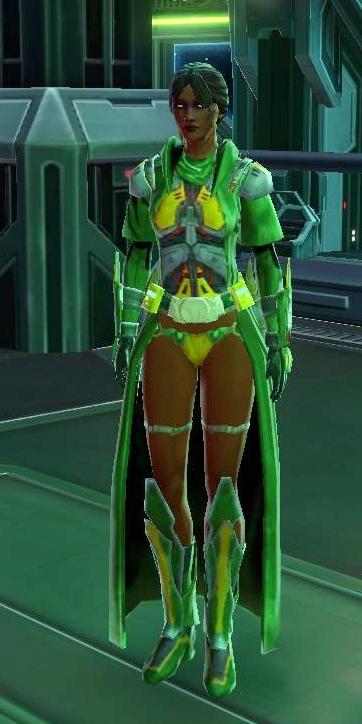 It’s curious, though, how many of the dye colors we get produce ugly results with the gear pieces, almost as if Bioware deliberately picked color combinations for the dyes that would generate a lot of ‘white elephants’ from the dye packs. 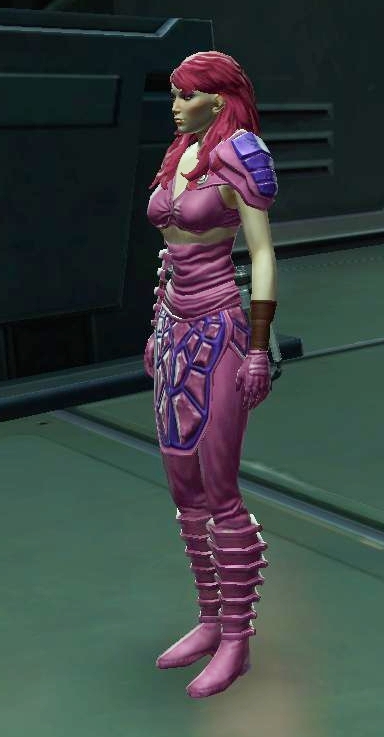 For example, other than the social gear, I have yet to find gear that the ‘medium blue/light blue’ dye doesn’t look _wrong_ on — and if you take the Bounty Tracker hat, any of the ‘trenchcoat’ tops, any of the ‘pants’ bottoms, any of the high boots, and add a pink/purple dye pack, all you’re missing is leopard-fur collars to be completely pimptastic. I would have been much happier if the Appearance Customization kiosks had been set up so that you could _pick_ the primary/secondary colors for your gear from a set of predefined colors; if Bioware felt it was necessary to make black/black rarer, there could have been a sliding cost depending on which colors you selected (and which piece you’re coloring — chest pieces should cost more than the others, because of the ‘match colors’ ability), but being able to _choose_ the colors you wanted would, I think, have wound up with _more_ people paying to recolor their gear than have been buying dyes. 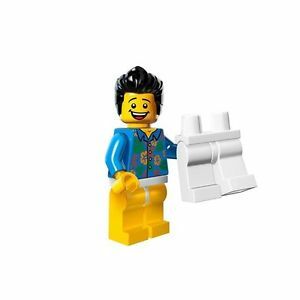 They could still go that way, reverting all the dyes on the GTN to their owners and setting up a mechanism where you could dump a dye pack into a widget at the appearance customization kiosk and it would give you a credit (based on the colors in the pack) against the cost of your change. The people who’ve speculated on the various combinations of black may be disappointed, but the rest of us would get more choices. Yeah, I’ve been using default colors a lot lately for just those reasons – a lot of dyes look wrong on everything, and a lot of items dye like crap. As for medium/light blue kit – I used it with reasonable success on the last handmaiden set (which has a collar that does not dye, so dark colors look stupid).